Artists can use line and color to represent or to abstract the world of appearances. Andy Berg uses line and color to signify the experience of being in the world. 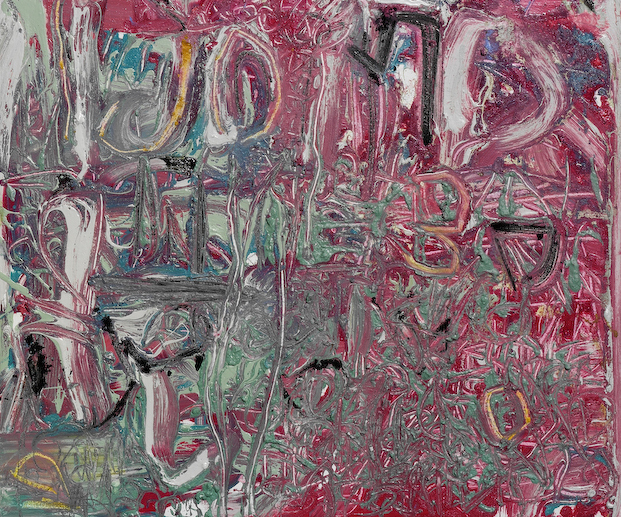 With no preconceived structure, he intuitively makes marks and applies paint in a push toward revelation. 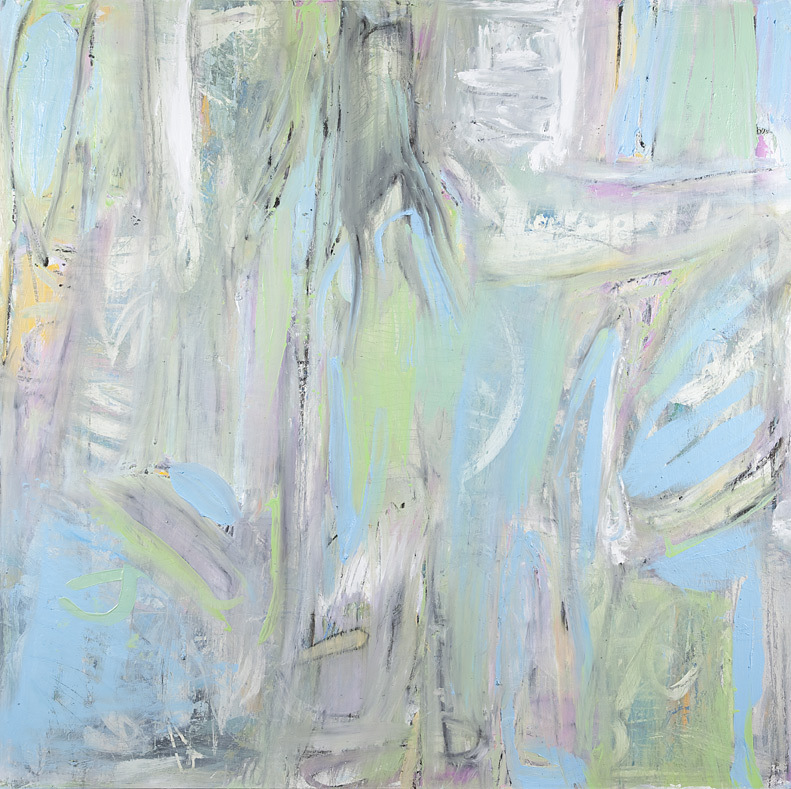 Surrendering to the creative process, he taps into what Carl Jung portrayed as “the play instinct acting from inner necessity.” Stirred by the Swiss psychologist’s belief in the power of imagination, Berg approaches each painting as a collision and reconciliation of opposites, infinite and finite, dark and light, spirit and matter. Pressing at and running over the edges, strokes and swathes of pigment form irregular patterns that squeeze, swell, intensify, and grow. Simultaneously constricted and expanding, the gathering of gestures is emerging and unstable, assertive and elusive. Berg grapples with his canvases, as he adds and subtracts elements over time. He explores the full possibilities of acrylic, oil, and house paints as they are smeared, scraped, smudged, and splotched. The dynamic teeters between flow and entanglement, as the surface both obscures and suggests what lies beyond. In his worked and reworked canvases, Berg brings forth specters of unseen forces or things felt but not named. Through his meditative practice, the artist adheres to the principle of wu or wu wei, letting be and aligning with Tao, or the natural flow. In his engagement with materials, Berg connects with his own physical being — applying, incising, or removing the fleshy paint with intensely physical actions. The traces of his impulsive yet purposeful movements are sinuous and abrupt, elegant and brutish, intricate and raw. Rather than contradictory effects, one generates the other. Berg amasses a stockpile of different types and varieties of paints, including art pigments and ordinary house paint. While limited materials offer consistency, this assortment requires constant adjustment to distinct properties, such as interaction with light, viscosity, color blends. This dissonance heightens the sensation of his body making contact and keeps the artist vigilant. The challenge is to balance the drive to learn and seek new perspectives with the drive to create a coherent whole, Jungian principles of differentiation and integration. While color often describes, Berg exploits its capacity for suggesting space and movement, light and substance. Shunning easy relationships, Berg selects colors that startle, juxtaposing pretty with jarring, lyrical with violent, emotional with contemplative. A palette of pastel blue, yellow, pink, and green recalls a sensuous rococo painting and conjures the feminine. Yet pink can play against type and becomes raucous even intimidating. His blacks and whites embody the underlying yin and yang, but they are laden with emotional, associative content. For his lines, Berg most frequently uses black, which references writing, calligraphy, or traditional drawing, some sense of the hand. The rudimentary elements of characters, glyphs, or symbols emerge from the artist’s spontaneous yet insistent arm movements. Reaching across the canvas or folding back on itself, line begets line in an irregular system that suggests meaning. But Berg insists he is simply the messenger, and the import remains unknown.